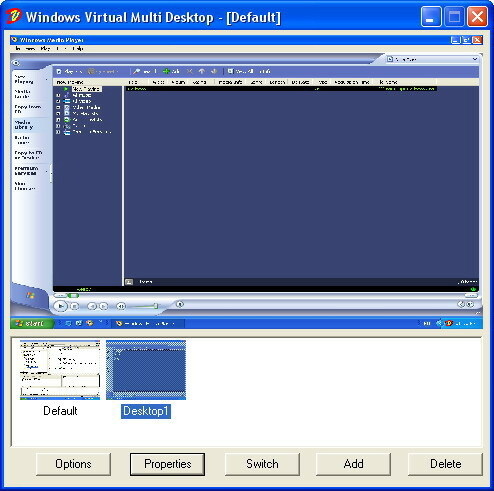 WinVMD is a Windows virtual multi-desktop software which can create multi virtual desktops. You can run different programs on different virtual destop. WinVMD allows you to switch from one desktop to another one with a custom hotkey or main window. If you want to do some private things or online surfing at work or some other places, WinVMD can help you. You can use one desktop to do your main job, the other one to do your private jobs or online surfing. If you hear someone comes in, WinVMD will help you to escape by using your custom hotkey to swith to your main desktop. WinVMD includes the following features: 1) Create unlimited virtual desktops; 2) Full hotkeys customization; 3) User custom hotkeys for easy navigation; 4) Preview desktop with main window; 5) Popup menu from the system tray; 6) “Green” software, No installation required. Right Click Enhancer Professional allows user to take full control of their right click menu. You can do following things with your right click menu using this tool. You can add frequently used applications, file and folder shortcuts in your right click menu. You can also organize these shortcuts in sub menu so they don’t clutter your right click menu. You can remove or disable right click menu entries that you don’t use. You can modify new sub menu of your right click menu. You can add new file types or remove existing file types using this tool. You can add new folder shortcuts in your send to menu. 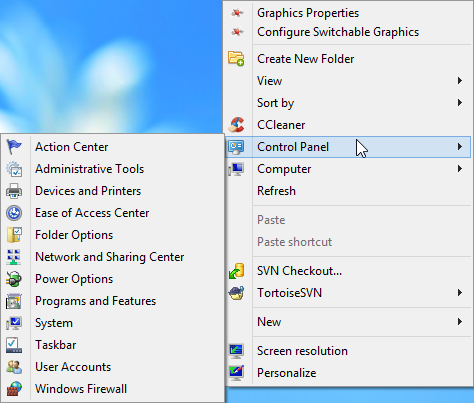 You can add useful options in your right click menu that allows you to do your day to day common tasks of computer faster. You can change right click menu of any file type. You can also change file associations easily with this tool. You can also modify right click menu of Internet Explorer. You can add, remove or disable right click menu entries inside Internet Explorer. GiMeSpace Desktop Extender provides a smarter way to use your desktop. It is a small and very simple program for Windows XP or later versions that will allow you to expand your desktop without any limits. When you move your mouse to the edge of your screen you will notice that your desktop extends beyond the borders of your normal desktop. There is a popup navigator panel where you can see your whole extended desktop and move your windows around. It provides a cheap alternative for adding more monitors to your computer. New in this version is that you can resize you windows to a size that is bigger then your physical screen. This can be very handy for computers with a small screen like netbook, etc. In the registered version you can select the autoarrange option to keep your windows next to each other. Also screenshots can be taken to give a real impression of your whole desktop. It has the option to make your Desktop scroll always when you move the mouse. This way you much more enjoy your extra space while at the same time you don’t have to move your mouse long distances any more! Other options are: Sticky scrolling, no more scrolling when you hit shortly the border. Scroll one screen at a time. And scrolling using the keyboard. There is a tab where you can select windows that you don’t want to scroll, like toolbars etc. You can also select a custom background image for your overview panel. You can limit the virtual desktop to the space used by your application windows. And you can save and restore the positions and sizes of all your windows. This program gives you back the pan and scan scrolling function of windows xp for windows vista and windows 7. Try out the free trial version to experience the freedom of more desktop space! GiMeSpace Desktop Extender provides a smarter way to use your desktop. 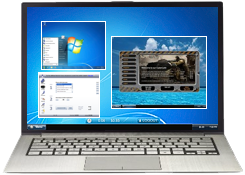 It is a small and very simple program for Windows that will allow you to expand your desktop without any limits. When you move your mouse to the edge of your screen you will notice that your desktop extends beyond the borders of your normal desktop. There is a 3D navigator screen where you can see your whole extended desktop and move your windows around, zoom in and out. It provides a cheap alternative for adding more monitors to your computer. You can resize you windows to a size that is bigger then your physical screen. This can be very handy for computers with a small screen like netbook, etc. You can select the autoarrange option to keep your windows next to each other. 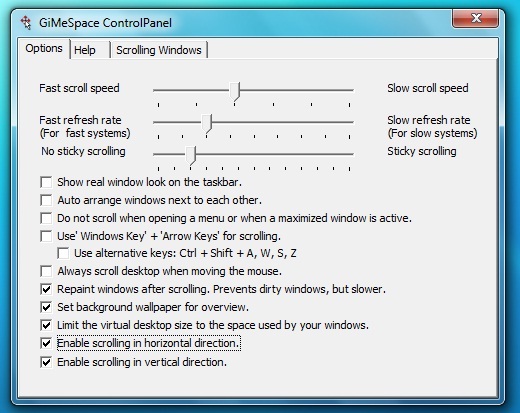 It has the option to make your Desktop scroll always when you move the mouse. This way you much more enjoy your extra space while at the same time you don’t have to move your mouse long distances any more! Other options are: Sticky scrolling, no more scrolling when you hit shortly the border. Scroll one screen at a time. And scrolling using the keyboard. There is a tab where you can select windows that you don’t want to scroll, like toolbars etc. You can limit the virtual desktop to the space used by your application windows. And you can save and restore the positions and sizes of all your windows. Bonus: Only available in the 3D edition. You can now assign hotkeys to different sections of your desktop! 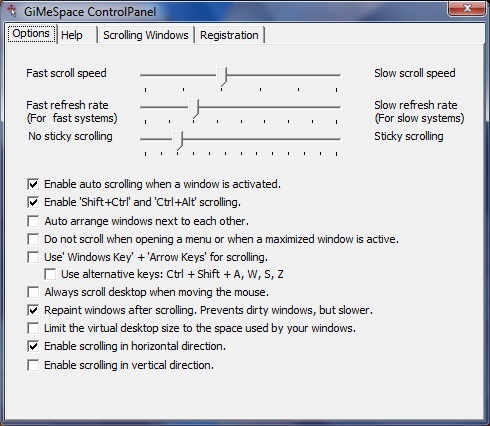 This program gives you back the pan and scan scrolling function of windows xp for windows vista and windows 7. Try out the free trial version to experience the freedom of more desktop space! Easy-to-use remote control software helps you administer and control remote computers any time and anywhere just like you are sitting right in front of them. No installation, no access codes or IPs to remember.With a double click admin can start a remote desktop connection, transfer files and chat with a user. This is how we (at Antamedia) help our own customers – and we found it very simple and efficient ! Antamedia Remote Software uses the HTTP/S protocol, allowing to safely work with the tightest firewalls and proxy servers without the need for the customer to change any settings. Easily transfer files between the local and remote PC’s. Supports Drag’n’Drop, file transfer queue and multiple simultaneous transfer connections. Helps you communicate with a person who operates a remote computer that you are connecting to. Create user groups and assign admins and users for each group. This feature prevents admin to to access computers from a different group. Software runs as a service and automatically starts with a Windows ! Best Icons Groups is a desktop icon management software. It provides widgets ability to organize hundred icons on small desktop space, allowing customers simple shortcut access. Best Icon Groups is a powerful, but easy to use and rich in animation utility. It has an up-to-date and fantabulous graphical interface. Primary functions: – creation of circle and/or line alignment groups; – shortcut packaging into icon stacks; – selectable themes and colors; – groups animation. You will get used to working with the software in no time and soon you won’t be able to live without it!